I've been looking everywhere for a decent Firefox RSS reader. I have used Flock's built in reader and it's ideal except I have loads of other Firefox Plugins so I really wanted to use that. After trying over 10 different ones I was still no further forward. 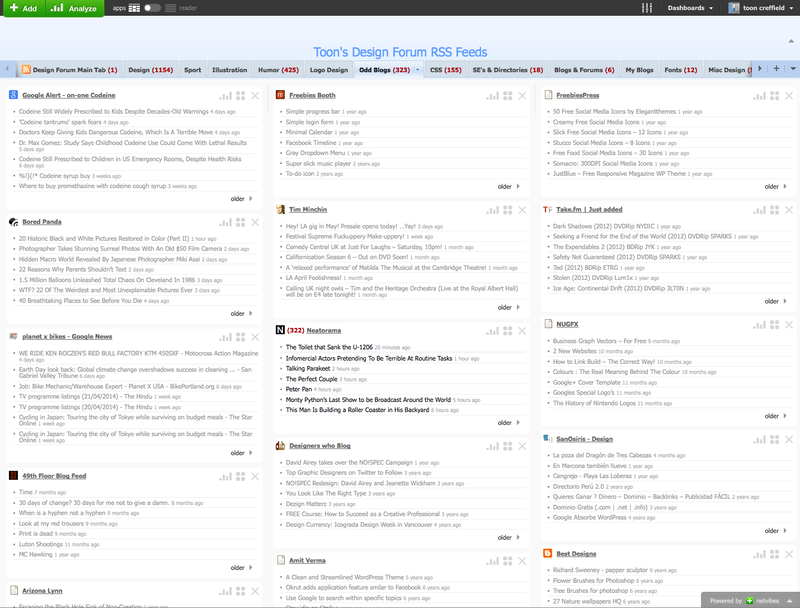 I can't say for PC because I haven't looked but Netvibes is the best RSS reader for Mac users by far. My page is already starting to get full.. It's solve all my problems and has brightened what was starting to be a stressful unhappy Monday morning. Thank you Netvibes. 2 comments to ''Graphic Design RSS Feeds"
Good luck with your blog from our new service adblogz.blogspot.com. It's the top place for advertisers to reach blogworld and for bloggers to save real money when you're blog shopping. Try it today and see for yourself. I've just discovered netvibes thanks to this blog and it's great (I'm a PC user). Mine's filling up nicely now.